The characters in Christine Amsden’s Cassie Scott series wouldn’t let her go when the story was done. 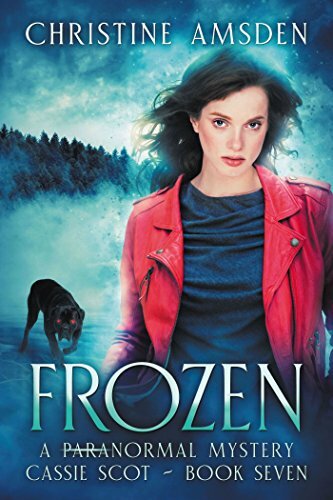 They wouldn’t let her readers go either, and Frozen takes up the tale with mothers and children, mothers and grandmothers, and the awesome responsibility of parenthood. Of course, this isn’t just regular parenthood. This is knowing your child will have magical powers, knowing you’ll temporarily inherit those powers, and knowing how to define yourself—never an easy task for Cassie who “set aside most of my old insecurities about not having magic in a magical world” but still feels “less.” How easily readers will relate. The author's characters, for all their powers, feel aching real and suffer the same fears and insecurities as all the rest of us. They grow older, and grow in responsibility, very convincingly and appropriately. Their world remains scarily dangerous—a reminder, perhaps, that magic won’t fix things any more than anything else can. Power doesn’t always corrupt, but might. And prophetic sight doesn’t always tell the truth about the future. Frozen is the sort of novel that invites readers to think as well as enjoying the tale. It’s powerfully human and magically powerful. It’s a great addition to the series, but it stands alone as a compelling story of relationships and mystery. There are no magic bullets, no deus ex machina solutions, and no one-size-fits-all methods of solving very human dilemmas. But there’s a great story, wonderful characters, and a coolly intriguing (possibly freezing) plot. Disclosure: I was given a pre-release ecopy and I offer my honest review. For readers who feel "less," not quite up to par. For mothers who feel trapped and changed. For those who wish they could see the future, and for those who know there are no magic bullet answers but kind of wish there were. For mystery solvers and lovers of the paranormal... Enjoy.